It gives me immense please to share the innovation and effort of our Tech Mahindra SMART Academy for Healthcare, Delhi students. given to someone who is in cardiac arrest. The working model has been developed by our Academy students enrolled in the Emergency Medical Technician course. I extend my warm wishes to you for a healthy and joyous New Year! This is the time of the year when all of us resolve to identify new goals. At the Foundation, our focus area for 2019 is to create consciousness and work towards empowering Persons with Disabilities. Let me introduce you to Firoz Malik. He is the son of a labourer who lives in East Delhi, Seelampur. Firoz was born deaf and had little access to Education. Both Firoz and his parents knew that as long as they are alive, they would take care of Firoz. Their concern was what will happen to Firoz after them. It was then that he enrolled himself in the Hospitality course from Delhi SMART+ centre. Today, Firoz works as a Wishmaster-Delivery Executive and mimes ‘I never thought of being an employee of such a big brand like Flipkart’. The Foundation support Persons with Disabilities through ARISE+ (our school education program) and SMART+ (our employability program). I would urge you to contact our Foundation team at your locations and volunteer for the cause or refer Persons with Disability to one of our SMART+ centres at info@techmahindrafoundation.org. Stay connected for stories of courage, joy and hope as we walk along the coming year. 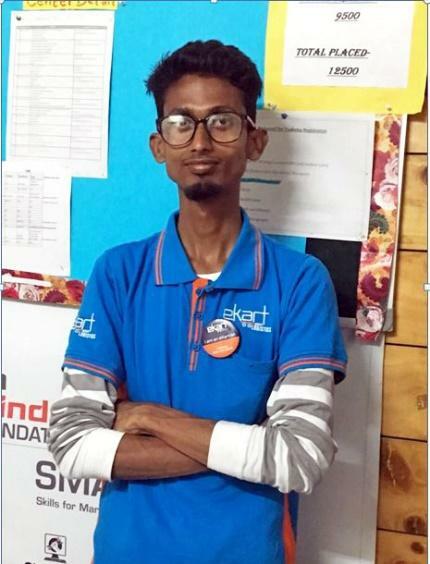 I am proud to share the story of Harish who passed out in 2015 from our SMART center in Hyderabad and is now earning Rs.45,000 per month which, with incentives adds up to 12 Lakhs per month. Many years have passed since was started our first SMART center in 2012. From a humble beginning, the journey has been remarkable for the SMART programmer, we started with four training centers and today we train 20,000 youth in different courses. The USP of the programmer has been its well-vetted module which stands on three foundation skills: basic English, basic IT skills, and job readiness. After the SMART centers we started SMART Academies and now we are on the way to setting up vocational centers. Thanks to the tremendous support of each at Tech Mahindra Without Which we would not have made this huge impact. I am delighted to share that we all did a fabulous job contributing to the national campaign – ‘Swachhata Hi Seva’. I am happy to tell you that across 11 locations TMF conducted 33 different activities and altogether we clocked 6937 volunteers and 32,959 hours. Thank you for coming out in such large numbers and making it a national mass movement. Take a bow Tech Mighties! For last three years, in the Rise For Good mailers, I have been writing and sharing some powerful stories of heroes who are making difference in their and in the lives of others. I have written about blind and hearing-impaired children doing well in academics, about young men and women battling adversity and rising above it to take care of themselves and their families and so on and so forth. But, in all these years I never mentioned one person who made it all possible – Vineet Nayyar. Yesterday, I was a silent listener when many of you spoke eloquently about his leadership and vision, his stoicism and calmness and his decisiveness. But what all of you don’t know is that ouside the courtroom and boardroom battles, he was quietly investing time, money and effort in trying to make a difference in as many lives as possible. Vineet’s genuine desire for a better world and his passionate approach towards bringing change in the lives of people is truly inspiring for all of us. It’s because of his unstinting support and trust in my decisions, that I was able to take a ‘leap of faith’ and took big initiatives over the last few years. He always believed that philanthropy is a state of mind that drives action and one need compassion, empathy and intent to change that one life. I personally feel that he has been a ground-breaking leader in social change. 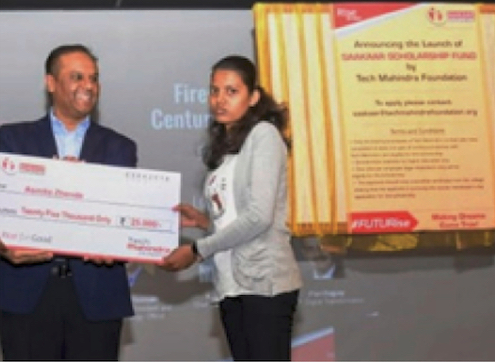 Its because of him that Tech Mahindra Foundation (TMF) works in the disability space in a range of activities and makes sure that we reach out to an equal number of girls as we do boys. Today we are among the leading organisations in skill development and all this was made possible because of his unqualified support and trust in me. I would like to thank him for both giving me the opportunity to lead the Foundation and for believing in me and empowering me. I am proud to have worked under your leadership. Thanks to your compassionate support we have put smiles on many faces. Team TMF joins me in wishing you good health and a long life ahead. Encouraging Individual Social Responsibility(ISR) is the need of the hour. But, how do we define it? And how do we it? There is an old saying that “the smallest of actions i setter than the boldest of intentions”. Every individual can make small contribution in his/her own way by doing the right thing. We are happy to share a checklist of things which you can do in your individual capacity and can have a great feel of personal satisfaction at the same time. I am delighted to share that the students supported by our Disability programme have done wonders in Maharashtra State Secondary Board Exams. This year, 12 visually impaired girls from TMF supported, Jagriti school for blind girls in Pune, passed the exam with flying colors. Seema Kharad topped her school by securing an impressive 90%, Snehal Patange stood 2nd by scoring 85.20% and Durga Yevale came 3rd by scoring 84.40%. The hard work and determination of these girls is unstoppable. Both Seema and Durga are very keen to go for higher education and learn humanities. Seema, a chess enthusiast wants to prepare for UPSC and dreams of becoming an IAS officer. Our second topper Snehal loves to dance and wants to do social service by becoming an advocate. Durga too loves to play chess and plans to take a road to teaching by taking the role of a professor. Friends, I am proud of the girls who are blurring the lines between ‘abled’ and ‘disabled’. At Tech Mahindra Foundation we believe that disability is not an impediment to academic success and thus empowering Persons with Disability becomes our mission. We wish all the best to students like Seema, Durga and Snehal who are working hard to conquer their disabilities. Smart Student Carving a niche with SMART Pay Packages! 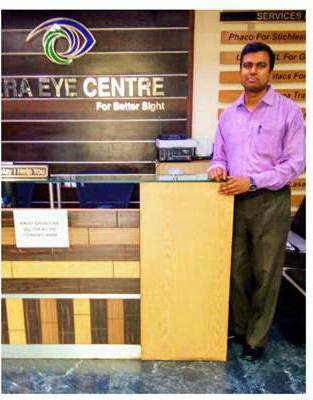 Today we are beaming with pride because one of our student has been placed with Neera Eye Care Center as a Front Office & Billing Executive, at a package of Rs. 3,24,000! Siddhartha’s story is very motivating. Siddhartha, a 35-year-old man, married with two kids, was struggling to make both ends meet. Despite having degrees his lack of confidence and communication skills came in his way of getting a decent job. Daily he struggled under to find a job. His life changing moment came when he saw a newspaper advertisement by Tech Mahindra Academy for Healthcare. “I had all the qualification but my skills were not polished. i know that only way I could get a decent job was through a professional course which would guide me to a career path. I enrolled myself in the Hospital Front Office and Billing Executive (HFOBE) course. My family and kids also supported me wholeheartedly. thanks to Academy. today I have a decent job in my hand” said Siddhartha with a smile of accomplishment on his face. This is the highest salary that any SMART student has achieved so far. It is heartening to see our students reaching such great heights. Not only me but everyone at TMF is feeling happy with Siddhartha’s accomplishment. Join me in wishing him all the best!